Morrisons, Britain’s 4th largest retailer, is trialling prototype technology in its Aberdeenshire meat plant which will see Scottish farmers become the first in world to receive detailed quality performance data on every sheep via the animals’ electronic ear tags. QMS Chairman Jim McLaren (left), pictured with Martyn Jones, Group Corporate Services Director, Morrisons pictured with the prototype equipment being demonstrated on the QMS stand at the Royal Highland Show. 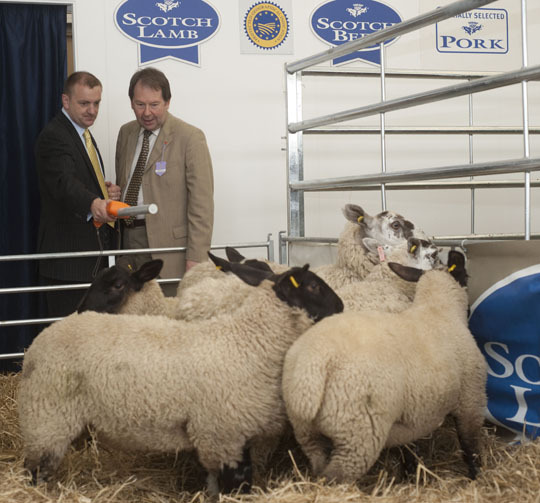 The retailer is working closely with Quality Meat Scotland, the Scottish red meat industry body, and ScotEID, the Scottish Government funded livestock traceability company, to test new equipment in its Turriff abattoir. If successful, it will put the final, missing piece in the jigsaw that can help farmers take advantage of EID to make breeding decisions at farm level based on performance evidence. Morrisons Agriculture Manager, Louise Welsh, said: “As Scotland’s largest processor of lambs we are delighted to work with the industry to develop an in plant system that can take an accurate supply of performance data from the individual carcase right back to farm level. 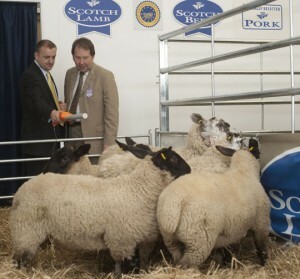 Jim McLaren, Quality Meat Scotland Chairman, said: “This initiative, which advances the technology to a stage where individual ear tag numbers can be linked to carcase weights and grades, is a major step forward for farmers interested in finding out what their returns are from specific breeds or breeding lines.